Hello out there! I have a new release and I have to reveal how much of a nerd I really am at the exact same time! YAY! First let’s talk about my nerdiness. So, I am a HUGE Harry Potter fan. I’ve read all the book numerous times, and seen all the movies at least twice (probably more). So when the new role playing group, Hogwarts: Your Story was announced, I was immediately enthralled with it. I’ve never role-played before. Some would say I’ve never role-played yet….In any case, I continue to make the attempt, because my love for the Accio sim knows no bounds. As I started spending more time there, I told myself that I would not build any HP related products. I wanted to separate my building self from this new rp’ing self. Unfortunately, I found myself inspired by the idea of creating a cursed opal necklace similar to the one talked about in the Harry Potter books. I became equally obsessed with having the necklace actually ‘curse’ people. Kismet is mine, and all these things have come together in my next new release, Cursed Opals by Dark Mouse. I plan to make 3 cursed necklaces, but will release the one nearest and dearest to my heart first. The necklace is inspired by Harry Potter, and features two animated poses, ‘curse me’ and ‘imperious me.’ The necklace provides you with a choice menu when you touch it. I hope you enjoy it for your RP’ing activities or just cause it’s a really pretty necklace. The animated poses were created by Elle Kirshner of Pulling Strings, and I’m forever grateful. 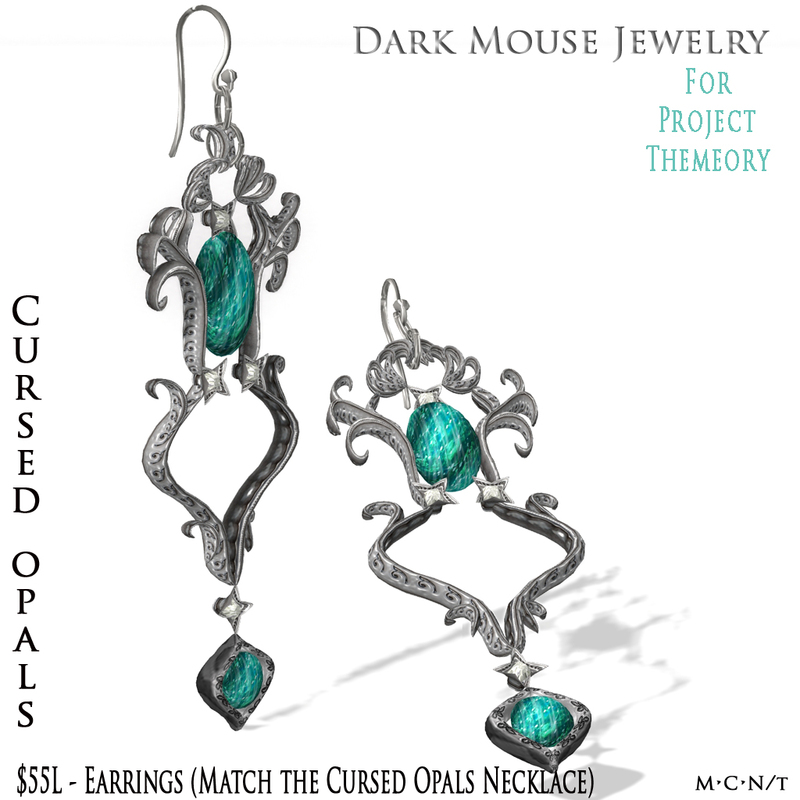 The necklace is available in my store for $400L, and especially for Project Themeory, I made matching ‘Cursed’ earrings for only $75L. The theme for Project Themeory is Halloween, so it seemed fitting! Here’s a teleport to the store, enjoy! 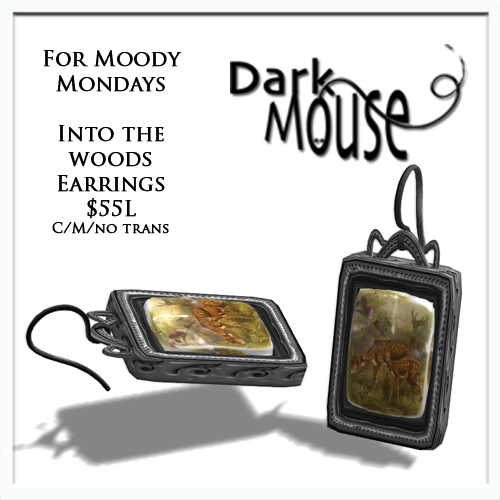 Dark Mouse in Moody Mondays! Hi there, I have my item for Moody Mondays out a bit early because I’m doing RL things this afternoon! I hope you like, earrings to match my Into the Woods bracelet and necklace from last week. I hope you like! After the event, I’ll have these out as a full set in the store! At the moment though the earrings are out for only $55L. Come and get em, here’s a teleport directly to the store! Also, if you’re not a member of my Dark Mouse VIP group, you really missed out this month ;-). Just saying.